Sports performance is exactly what it sounds like. It is training designed specifically to improve an individual’s performance within their sport, including any bodily activity that enhances or maintains physical fitness and overall health and wellness. This means that endurance exercise adheres strictly to the principle of specificity: the body will adapt in direct relation to the stressors placed on it. So, move, eat, rest, repeat makes for a decent training plan, up to a point. However, if you want to maximize your performance gains, eventually you need to train smarter: smarter movement, smarter eating and smarter recovery. Believe it or not, this advice works for aspiring athletes, man’s best friend – the dog, and farmed aquatic animals (fish and shrimp) alike. Athletes use nutritional strategies to improve their training and performance through increasing their metabolic capacity, delaying the onset of fatigue, and improving muscle hypertrophy by enhancing recovery, improving immune function, and decreasing oxidative stress. Krill oil is rich in long-chain omega-3 polyunsaturated fatty acids, eicosapentaenoic acid (EPA) and docosahexaenoic acid (DHA), which have been found to reduce inflammation and have positive effects on the cardiovascular system. Krill oil strengthens immune function following a maximal exercise test. 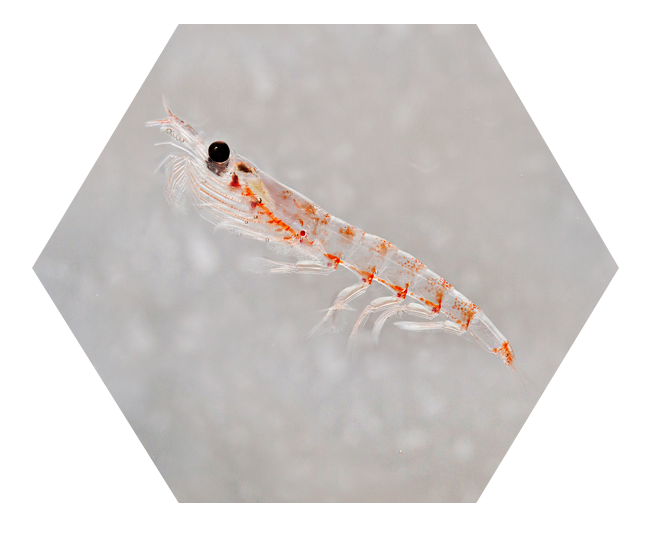 Aker BioMarine is dedicated to studying the effects of krill on humans, pets and farmed fish and shrimp. One of our latest projects, conducted on Norseman triathletes who run one of the toughest triathlon races on the planet, showed a significant decrease in omega-3 levels in the body following an intensive endurance event. Maintaining optimal omega-3 levels may be important during the recovery phase after intense exercise. It is important to keep in mind that lower omega-3 levels have been associated with increased risk of illness, which may cause training disruptions. For this reason, it is important to have a good source of omega-3 fatty acids, such as krill oil, when engaging in intense training. You might wonder how professional athletes are related to animal performance. Well, we all want to perform: athletes, sled dogs and even salmon. The connections are actually more related than what you might think, as nutrition plays an important role for all of us. Aker BioMarine has identified four positive krill effects across these species when it comes to performance: inflammatory response, heart health, well-being and muscular system. Sled dogs for example, have a high metabolic energy expenditure during endurance exercise, and it has been shown that repetitive endurance exercise is associated with lipid peroxidation and reduced plasma antioxidant concentration. Excessive free radial production induced by an extreme exercise challenge, such as the Iditarod race, sled dogs very-own Norseman, can induce inflammation and generate muscle damage. In order to increase our krill knowledge on dogs, Aker BioMarine conducted a study on the animals in the Iditarod trail sled dog race, the hands-down toughest annual long-distance sled dog run. In this project, we found that five-week krill meal supplementation of sled dogs before the race led to higher amounts of omega-3 polyunsaturated fatty acids consumed, and therefore a higher omega-3 index at start of race. A higher index is associated with a significant reduction in the exercise-associated rise in inflammation and a tendency to minimize the level of muscle damage. This is linked to the human results, where krill plays an important role keeping the omega-3 levels up during endurance performance. The results of this study are encouraging for krill meal supplementation for dogs in general, whether they are performing in long distance races or taking their leisurely afternoon walk. But what about salmon? During the past decade, the effect of krill on salmonids health and fillet quality has been investigated. Fat content, fat distribution and fillet quality may be influenced by feed composition. Due to krill inherent advantages i.e. feeding stimulants, omega-3 fatty acids bound to phospholipids and highly digestible peptides, krill improves fillet quality, both in terms of yield and texture. What is curious about fish is their swimming exercise, in other words their performance, which increases the muscle growth and flesh quality. Fish are known for their great capacity for aerobic, sustained swimming, and anaerobic, burst swimming. Swimming activity in fish is accomplished through the activation of the skeletal muscle, the largest tissue in the animal, representing more than 50% of its body weight. Skeletal muscle in fish is composed of two functionally and anatomically separated types of muscle. Flesh quality in salmon is the result of a combination of characteristics of skeletal muscle, which include the muscle chemical composition (fat content and fatty acid profile, glycogen stores, oxidative stability, color) and muscle cellularity and is strongly influenced by a variety of extrinsic factors such as feeding, pre- and post-slaughter handling, processing, and storage procedures. One of the major criteria of flesh quality is texture, which is determined by muscle cellularity (fiber number and distribution) and connective tissue characteristics. Different studies have shown an improvement in gaping and fillet firmness and a decrease of melanin spots in salmon fed krill diets, which are key requirements for the salmon industry. These results also correlate to humans and dogs, where the omega-3 phospholipids of krill play an important role in reducing muscle inflammation. As you can see, there is scientific evidence on the benefits of krill across the three species when it comes to performance. Humans, dogs and salmon performance can benefit from krill, with their daily feats of biking, running and swimming endurance increasing their muscle growth, recovery and fish flesh quality. The results are related, and we need to start looking at the evidence and finding ways to share it as a story telling. Want to learn more, please contact us.